When you hear the word “porcelain”, you probably think about porcelain dinnerware and other delicate things. 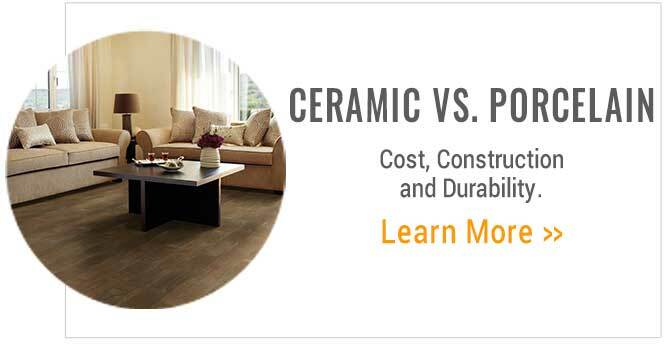 Surprisingly, porcelain flooring is actually an option, and a durable one at that. Porcelain floor tiles are incredibly strong and great for any application, including floors, walls, showers, and even outdoors. Technology is so advanced that it has allowed for different tile shapes, durability levels, styles, constructions, wear ratings, and many other important characteristics to be possible. Among the endless options, knowing what to buy can be a challenge, so let us help guide and teach you what your options are and what it all means. Porcelain tiles are composed of a clay mixture that is denser than that of a ceramic clay. Where ceramic tile is usually a red mixture, porcelain tiles are usually white, grey, or colored to match the surface color. 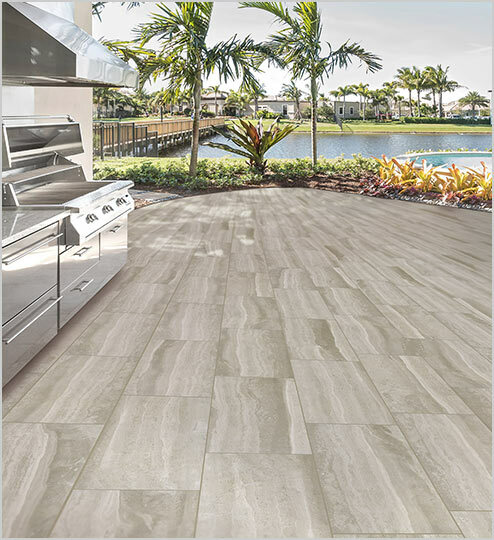 Typically made of clay, feldspar, quartz, and talc, the raw materials of porcelain tile make a great foundation for an incredibly dense tile. Once the mixture is shaped into a tile, glaze is applied as a protection for the tile as well as attractive imagery or colors to replicate a natural stone or wood look. Porcelains are also fired at much higher temperatures and are pressed at higher pressure per square inch than ceramic, making them harder and more durable by comparison. Once fired and pressed, the tile has completes its process & is strong enough for installation on a floor. Square Designed to resemble the look of natural stone, square tile shapes are very common and come in many sizes. Anywhere from 6” all the way up to 48”, you have a plethora of options when it comes to square sizes, allowing for unique tile layouts. Using square porcelain tiles, you can achieve looks like the grid pattern, a brickwork look, diagonal layout, checkerboard, and many other fun designs using different sizes together. Square sizing is the classic tile size, and the perfect option for any traditional person. 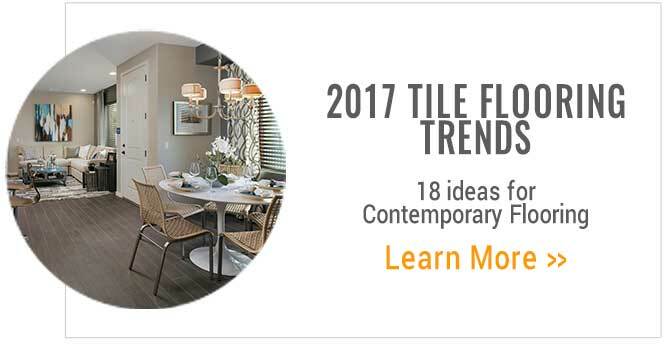 Tile manufacturers have incorporated rectangular sizing to offer a new, modern, contemporary look in the flooring world. These new sizes are becoming more and more popular in residential and commercial applications. A rectangular size tile has a length that is approximately two times the width of the tile. Tiles that are rectangular in size give the illusion that small spaces are actually larger and more open. By minimizing the visual impact of grout lines, this makes the tile pattern flow, making the floor appearing more seamless. If you are interested in a sleek and modern look, a rectangular shape is the perfect solution. 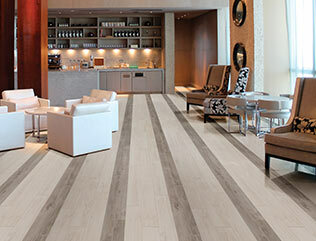 Plank Porcelain planks are the perfect durable alternative to hardwood flooring. 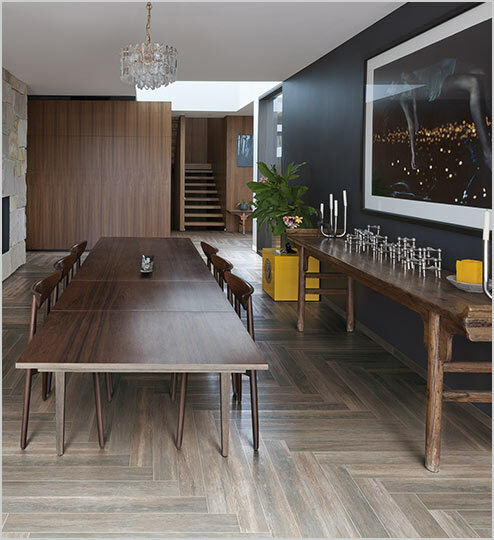 Made to replicate the look of natural hardwood floors, plank porcelain tiles have a length that is significantly longer than its width. 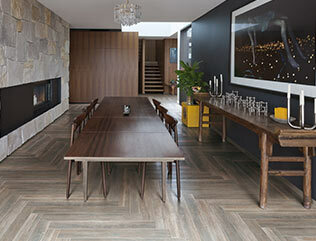 Planks can give the illusion that a small room is larger, with its long, linear look. With plank installations, you also have less grout lines covering the floor, which can help it look less busy, in turn enlarging the feeling of the space. 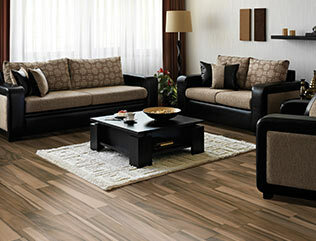 If you like the look of hardwood floors, why not choose a durable and long lasting porcelain plank? There are many style options for porcelain floor tiles. Amazing advances in technology have allowed for attractive looks that are truly comparable to natural wood, stone, and even marble. These styles beautifully replicate the real deal, it never has to be sealed (unlike stone), and it can be installed on any level of the home. With so many stunning options available for every style, samples are a necessity in the decision making process. Low - A consistent look in color and texture across the entire floor surface. Any differences are minimal. Medium - Slight differences in color or texture may be noticeable. High - Large amounts of variation in shade or texture between multiple tiles. Tiles from multiple cartons should be blended together for the best appearance. Random - Tile texture and color is randomized compared to others in the batch. Blend tiles together from different cartons to ensure randomness. 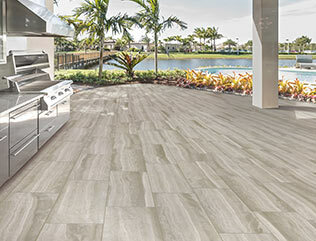 This might sound silly, but a porcelain tile is not just a porcelain tile - there are many variations. Think of it like how there isn’t just one option for an apple, there are many different types, sizes, flavors, and other characteristics that distinguish one apple from the next. 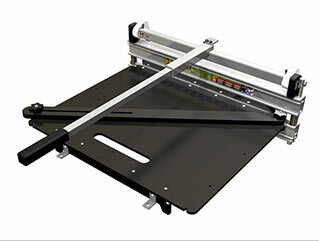 While FlooringInc.com may not offer the whole gammit of apples (whoops!) porcelain tiles, we do offer some popular and important body types. Glazed Glazed porcelain tiles have a durable surface coating which has an image and also protects the porcelain clay body. The porcelain tile body underneath the surface can be many possible colors, typically brown, tan, beige, white, etc. A glazed tile is the most popular one, often a lower cost than other body types, and in abundance. Body Match Also known as Color Body, Body Match tiles are designed so that the body of the actual tile is colored to match a color that is in the top surface glaze. This is particularly important when any damage occurs: the damage appears less noticeable since the color underneath somewhat blends in with the color of the surface. Double Loaded The Double Loaded body, also known as “Double Charging”, is when two pieces of porcelain tile (not necessarily the same color) are sandwiched together and fired to form one very solid piece. This creates a durable and hard wearing tile that has the surface color going through approximately half of the tile thickness. The application of the tile can be an important factor in which tile to choose for the right environment. Just as you likely wouldn’t bring flip flops on a winter vacation, you would not want to choose the floor tile for your space. Below, we break down the different application types. Residential Residential floor tiles are rated for light to medium foot traffic only. Designed to withstand typical foot traffic in the home, they are perfectly suitable for use in living rooms, bedrooms, hallways, kitchens, etc. Remember, as with any flooring, it is important to use entrance mats at doorways from the outside to the inside to remove excess dirt and rocks from shoes to lessen the possibility of damage to the floor surface. Tiles that are commercially rated tiles are perfect for areas that have heavy foot traffic, such as restaurants, offices, malls, shopping centers, and other workplace areas. These tiles are extra durable and have a stronger surface glaze that can withstand wear better than simple residential tiles can. Since commercial tiles are so strong, they can also be installed in residential spaces, but it may be overkill. Remember, it is also important in commercial environments with any flooring to put entrance mats down so that rocks do not get tracked in and possibly damage the floor. Residential/Commercial The majority of our tiles are suitable for installation in both residential and commercial spaces. 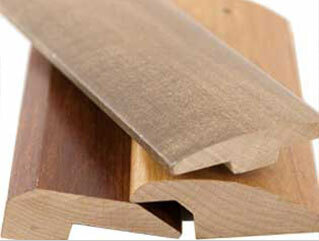 This gives you a wide variety of beautiful options that are durable enough for heavy trafficked environments. 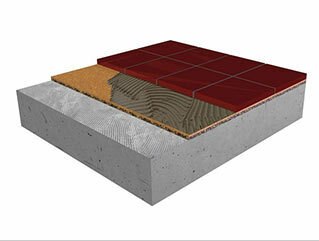 Rest assured that your flooring provides a strong foundation to walk on. A tile finish is the top portion of the tile that you actually see once it’s installed. There are many options, including glazed, polished, and unglazed. Glazed A glazed tile finish is the common surface for man made tiles. This durable surface coating protects the clay body of the tile and offers an attractive look. Think of a tile glaze like a coat of paint on your walls (except obviously very durable). Most of our porcelain tiles have a glazed finish. Polished A polished tile finish is an attractive and modern look for any space. The polished look adds a nice sheen or reflection to the flooring surface that resembles that of glass. Unglazed Offering a most natural look, there is no finishing on the tile, resulting in a tile that is the same color throughout. The tile is a natural clay color, and needs to be sealed often to offer stain resistance. The Porcelain Enamel Institute has developed a rating system (Pei Rating) to help you determine which tile is suitable for your application as per the ASTM standards (American Society for Testing and Materials). Different ratings essentially define the tile’s use and suitability for a given application, to ensure the correct tile is installed for any purpose. What do the PEI ratings mean? In life, you really do get what you pay for. With a cheeseburger, for example, if you have $2 in your pocket and just want something quick, you are going to get something that is probably greasy, small in size, made in line with 15 others, and this might be alright with you. If you have a couple more dollars, you may go buy a nicer burger that was prepared with some love and individuality put into it, possibly less greasy and you feel better afterwards. Or you can go all out, ordering the fanciest burger in town with all of the fixings - not only does it taste amazing, but it is a beautiful work of art. The moral of the story is that as with anything in life (burgers and tile included), you typically get what you paid for. If you need the most durable, attractive and overall quality tile, think of that as the best burger with all of the fixings and TLC. 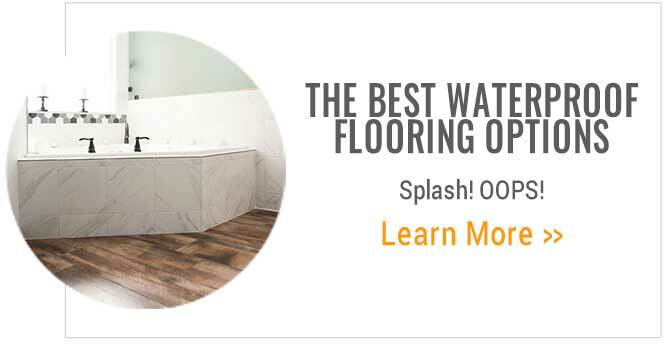 On the other hand, if you just need something that will functionally work, aren’t too focused on having a high definition appearance of the tile, and have a tight budget for a project, then the first burger would be more ideal. The great news is that we offer many tiles for all of your burger…. tile options. Order your free samples so that you can see and feel the differences for yourself.